In July I booked a weekend away in Berlin with my kids. I had visited the city some two decades ago on a fleeting visit and don't recall much other than visiting Brandenburg gate, going to the Wall Museum and being conned into buying a small piece of the erstwhile Berlin Wall. This time however, I decided to be more alert. The boys and I took the Deutsche Bahn out of Munchen and reached the capital after a seven hour journey. The train was spacious with plenty of leg room, clean and very quiet. Barring the announcements about the upcoming station and the ones welcoming new passengers on board, there was very little coming through the PA system. After a late lunch, we checked into our hotel and after a brief rest headed out into town for the evening. After I booked tickets for us to watch a late show of Despicable Me 3 in English, I checked on tripadvisor for dinner suggestions. Mabuhay was an Indonesian restaurant was about a 12 minute walk away and with an hour left for the movie to start, I decided to go there. My son was the first to spot the restaurant and from his expressions, I could say that he wasn't best impressed. When I joined him, I could see why. It was little more than a shack that was at the grey apartment block. My guess is that it was designed as a garage but now served as a restaurant. There were a few tables and chairs that had been laid out and despite modest appearance, the place was heaving that Saturday night. We found ourselves a place on one of the tables, wiped it dry (there had been a drizzle earlier) with some tissues, caught the eye of the waiter and got waiting. We had been waiting for a good few minutes and there seemed to be no one coming to take our orders. So sent my son over to tell them that we were ready to order. A fair few minutes passed and still no one turned up and this time I sent him again to tell the owner that we were running late for a movie. And still when no one had turned up at our table, I decided to leave as, by now, I was conscious of missing our movie. My son insisted that we inform the owner of our decision and ran inside to let him know. And this brought the owner Mikhael (as I would later find out his name) out running and he apologised profusely for the misunderstanding and proceeded to suggest something that I had not expected. He offered free food for us to take away and also to drop us off at the cinema in his car. I turned down his offer of food but said that if he would drop us off at the cinema, that would give us enough time to eat at the restaurant. And as we tucked into delicious gado-gado and stir-fry veg noodles, Mikhael backed out his car and cleared it, so we can drive away as soon as we finished our meal. 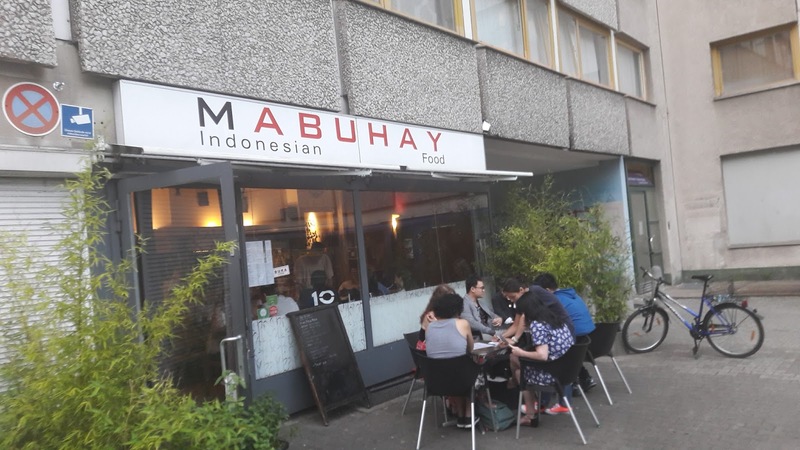 The bill was modest and on our drive to the cinema, Mikhael mentioned that he worked in finance during the week while his Indonesian wife ran the restaurant and that he helped out at the weekends. Mabuhay, he said was his passion and that being small meant he could still be in touch with the people. There was no point growing so big, he said waving at the countless restaurants in Potsdamer Platz, that you'd become faceless and lose contact with the people. We thanked him profusely for this gesture and as we took leave of him, I realised that it wasn't just my stomach that was full but my heart too.